After a sleek 23 litre solo microwave? The Russell Hobbs RHM2362S fits the bill, complete with 800w of power. Looks stunning, and offers a decent capacity. None to speak of. With a 23 litre capacity, the Russell Hobbs RHM2362S is a medium sized solo silver microwave oven, with a stylish design and easy to use controls. It features a modern design, which will suit the majority of kitchens, as well as well labelled touch controls. The logo is fairly subtle, which should please those who don't want their kitchen appliances to stand out with loud graphics. The red digital LED display is clear, and easy to read, even in brightly lit environments. Inside is a 27cm removable glass turntable, which should accommodate the majority of large plates, with an overall somewhat spacious capacity of 23 litres. 5 different power levels are provided, with a maximum of 800w power output, and several auto cook options are also included. Russell Hobbs microwaves are typically pretty reliable, and the RHM2362S feels like it is well built. Overall this microwave performs very well, impressing our test team - we wouldn't hesitate to recommend it. Overall this is a great solo microwave - clearly a lot of thought has been put into the design. 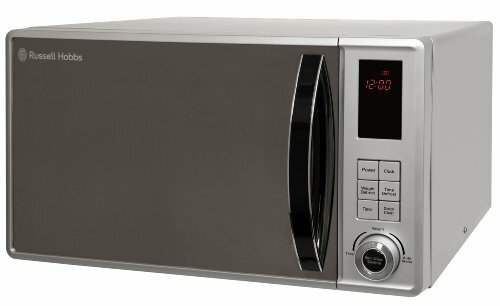 If you need an inexpensive solo microwave, then the Russell Hobbs RHM2362S comes highly recommended.